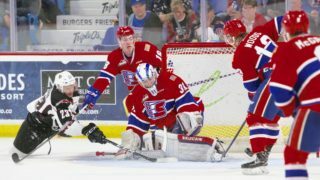 SPOKANE, Wash. — The Spokane Chiefs rode a strong defensive effort and the continued hot streak of Riley Woods to a 4-0 shutout victory of the visiting Prince George Cougars on Wednesday night at Spokane Arena. The Chiefs jumped out to a 1-0 lead at 4:13 when Ethan McIndoe slipped a pass from the left wing to Woods driving inside the face-off dot. Woods found open space inside the near post to beat goaltender Taylor Gauthier for his 19th of the season. 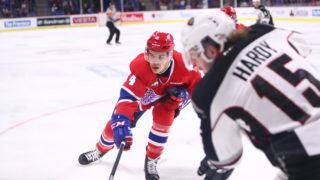 In a penalty-filled second frame, the Chiefs found the net once more as rookie forward Adam Beckman chipped a shot off a Cougar defenseman to score his WHL rookie-leading 13th goal. 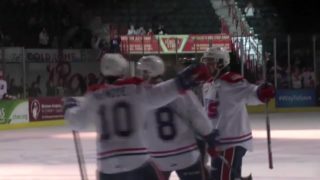 Spokane tacked on two more goals in the final period – Woods on a rebound for his 20th and rookie Cordel Larson on an empty net for his third – to reach the final score. Overage forward Luc Smith picked up his first point as a Chief with an assist on Woods’ second goal of the night. 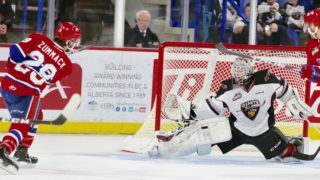 Spokane’s Bailey Brkin was excellent between the pipes, picking up his second shutout of the season as he went a perfect 27-for-27 on shots faced for the Chiefs. Gauthier ended the night 27-for-30. The Chiefs went 0-for-9 on the power play and 3-for-3 on the penalty kill. 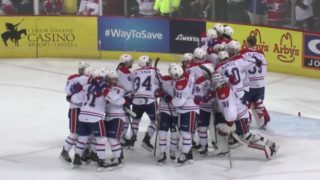 The win pushes Spokane into second place in the U.S. Division, one point ahead of Portland. The Chiefs hit the road for a three game road trip starting Friday at Everett, returning home Friday, December 7 when they take on the Lethbridge Hurricanes for Festivus Night. It’ll be another Fred Meyer Family Pack Friday with Chiefs fans able to purchase a hot dog, Coca-Cola product, and their ticket to the game for $15/person. There will also be U.S. Marine Corps on hand to accept new, unwrapped toy donations for the Toys for Tots program. 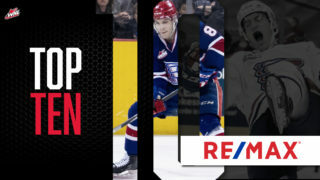 Tickets for December 7 and all Chiefs home games are available online here, over the phone at 509-535-PUCK and in-person at the Chiefs’ Ticket Office at Spokane Arena.